One of my favorite spring/summer treats is rhubarb. My mother would be so happy when she saw the rhubarb sign hanging from the mailbox of a local gardener who sold the excess produce from his garden. When Mom came in with a large paper grocery bag bursting with freshly cut rhubarb, we knew that we would be having stewed rhubarb and rhubarb crumble in the near future. Today, I have a good friend who graciously shares the bounty of his father's rhubarb patch with me. A couple of weeks ago, I received a huge bag of freshly cut rhubarb and, like my mom, I made a rhubarb crumble for dessert that same night. 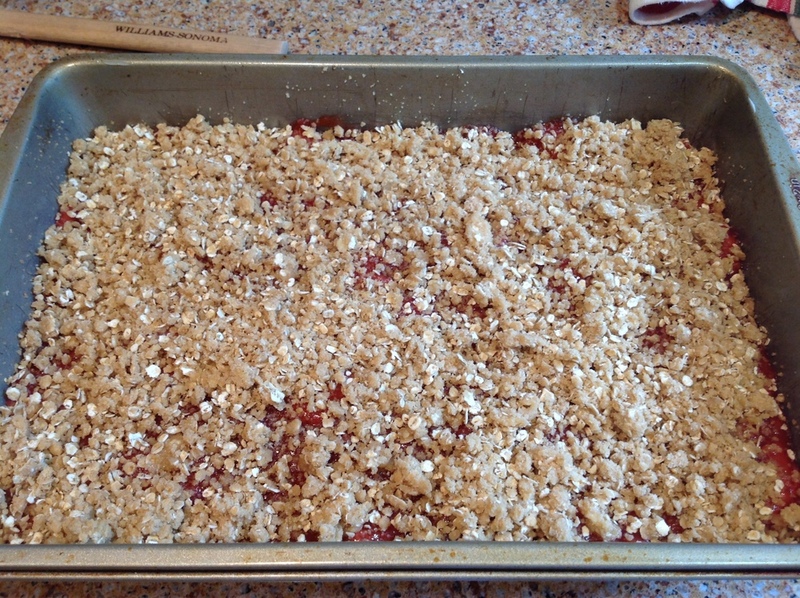 As a thank you for the rhubarb, I wanted to make a portable rhubarb treat that I could share with my friends at the park so I searched on Pinterest and came across a recipe for strawberry rhubarb crumble bars. Strawberries and rhubarb play so nicely together don't you think? The crust for these bars has the same ingredients as my mother's rhubarb crumble recipe so I knew they would be tasty. In fact, these bars are DELICIOUS!! So, with rhubarb and strawberries plentiful at the local farmer's market, today I am going to share the recipe for these bars with you. (This recipe was created by Audra a/k/a The Baker Chick). Okay, let's bake! Here are the stars of today's recipe. Just look at that luscious rhubarb! And those ruby red strawberries! YUM! Preheat your oven to 350 degrees and lightly coat a 13 x 9 baking pan with butter. Combine 2 cups of chopped rhubarb and 2 cups of sliced strawberries ina 2 quart saucepan. Let me digress here for a moment to talk about measuring the fruit for this recipe. It is really so much easier to use a food scale to measure the rhubarb and strawberries instead of a dry cup measure. One cup of chopped rhubarb weighs 4 ounces. One cup of sliced strawberries weighs 6 ounces. That is true today, tomorrow, always. Doesn't matter how big or small the berries are. Put your bowl on the scale, chop or slice the fruit, put it in the bowl until the correct weight is reached. Boom. Done. No guesswork. Okay. Back to the recipe. In addition to the chopped rhubarb and sliced strawberries, you want to add 1 tablespoon of lemon juice to the saucepan. Cover the saucepan and cook the fruit over medium heat until the fruit is tender. Stir the fruit occasionally as it cooks. This should take about 8 to 12 minutes. While the fruit is cooking, combine 1/2 cup granulated sugar and 2 tablespoons cornstarch in a small bowl. When the fruit is softened, stir in the sugar/cornstarch mixture. Continue cooking the fruit filling, stirring continuously, until it reaches a boil. Continue cooking until the filling until it is thickened, about 1 minute, then remove it from the heat and set it aside while you make the crust. 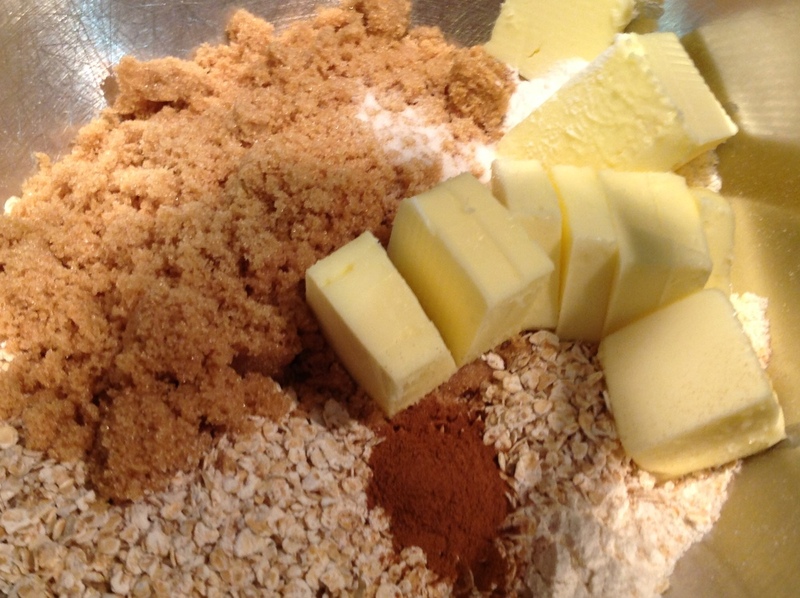 In the bowl of your mixer, combine 1-1/2 cups AP flour, 1-1/2 cups quick cooking oats, 1 cup packed light brown sugar, 3/4 cup salted butter, softened, 1/2 teaspoon baking soda, 1/4 teaspoon salt and a healthy 1/2 teaspoon cinnamon. The cinnamon is my addition to the crust. 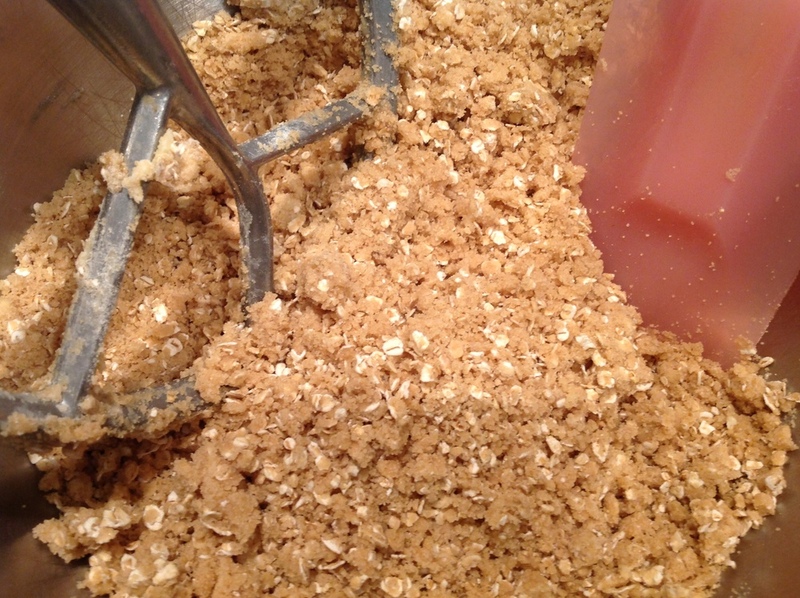 Mix the crust ingredients on low speed until the crust mixture is crumbly. It will not hold together in the bowl. Place 1-1/2 cups of the crust mixture in a small bowl. Scrape the remainder of the crust mixture into your prepared 13 x 9 pan and press it firmly into the pan. Then, spread the strawberry rhubarb filling mixture over the bottom crust. Spread the filling all the way to the sides of the pan. Finally evenly sprinkle the reserved crust mixture over the top of the filling. Bake the bars for 30 to 35 minutes until the crust is evenly golden brown. Remove the bars from the oven and allow them to cool completely before attempting to cut them. These bars are soft all the way through but should hold together when you pick one up to eat. I will tell you these bars were VERY well received. I brought home an empty tray from the park, always a sign that my baking efforts were successful. If you are looking for a different spin on the classic strawberry rhubarb combination, you may want to give these bars a try. I can tell you that I will definitely be making these tasty morsels again ... and again and again. Happy baking!